Traveling for races is always exciting, but the opportunity to race in my favorite city in the world, caused an overwhelming explosion of emotions that may have actually hindered me. I will explain that last part a bit later, but let me start from the beginning. 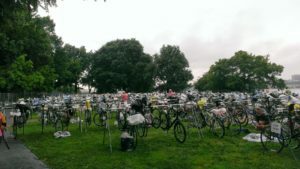 In order to race in the NYC Triathlon from out-of-state, a lottery is performed and in February of this year I was notified that I had been chosen to race. At the time I was not quite sure about it, as my race schedule was already pretty full, but I had heard great things about the race, so I decided to go ahead and put it on the calendar. How many times was I going to be chosen via a lottery…right? I have entered the lottery for the NYC Marathon for the last 3 years and was never chosen, therefore I felt like this may be a one-time opportunity. 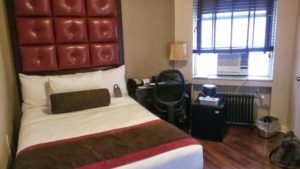 I made my arrangements immediately, and found some inexpensive accommodations at Hotel Belleclaire which ended up to be a very nice boutique hotel on the upper west side of Manhattan, beautifully positioned directly between transition and the finish line. The challenge I had was, how do I transport my bike to NYC. I had a few choices. 1) Tri-bike Transport which was $300 each way. 2) Take my bike completely apart and take it with me, then take it to a bike shop to be put back together for $75 and again when I returned, not to mention possible oversize luggage fees at anywhere from 75-150 bucks. 3) Use shipbikes.com and buy a reusable AirCaddy for $100 and then ship my bike via FedEx, directly to my hotel and back home for $100 each way with very minimal dis-assembly of my bike. I chose option 3, which turned out to be very convenient. The Air Caddy came in a very flat box and was assembled in 10 minutes and my bike was then placed in the box within 5 minutes and ready to ship. 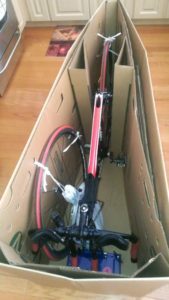 It comes with a fork plate that stabilizes the bike in the box and then a series of other corrugated cardboard is placed around the bike which secures and stabilizes it even more. The only small adjustments that need to be made are to remove the saddle and seat post together, and fold down the aero bars. Each is just the loosening of two allen screws. I only had to bring my small bike tool with me in order to tighten them back up upon re-assembly. I taped up the box, added the label which is purchased through shipbikes.com and then called for a FedEx delivery representative to come by and pick it up. Easy breezy. It all happened like clockwork. Of course since this is the first time I was shipping my bike I was a little anxious, and I was going to be, until I re-assembled in NYC. I left Friday Morning two days before the race and was so excited I could barely contain myself. Not just for the fact I had the opportunity to race in my favorite city I have ever been to, but I was also going to spend some time with friends I hadn’t hung out with in what seemed like forever. 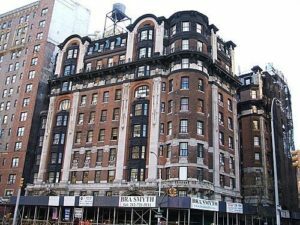 All of the pics online of Hotel Belleclaire were of course beautiful, but in New York City it is sometimes a crap shoot. The marketing pics look great, but when you get there, sometimes you get a room that a little worse for wear. Hotel Belleclaire was absolutely beautiful and the service was first-rate. I was in my room for about 30 minutes when the front desk called just to ask if everything in the room was alright. I was a little shocked because I never experienced that before. It is such a simple concept to give a 30 second call to the guests and it made me feel kind of special. Before I knew it, there was a knock at my door and there was a bellman with my bike. Talk about service. After I put my bike together I phoned the front desk and requested that they store the box since the room was small. I didn’t really care about the size of the room since it was just me, but the box and my bike took up a little more room. It turned out that they could not find anywhere to store the box, so instead of just saying “Sorry, we cannot do anything about it”, they upgraded me and put me in a larger room to accommodate the box. That, was to me, an amazing touch. 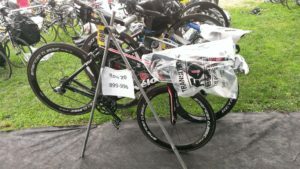 On Sunday after the race, I boxed up the bike and the concierge told me to just leave it in my room. Monday morning I received a text from FedEx notifying me my bike was picked up and that the estimated date she would be back home was Thursday. If you are going to be in NYC on the upper west side, I highly recommend the Hotel Belleclaire. I think you will enjoy it. Now back to our regularly scheduled program(after my little endorsement). 77th St. and Broadway and the Hilton was on 55th and 6th so it was 22 blocks south and two blocks east. No big deal, and it was nice outside so I decided to walk. Here is where I started with a little hinderance. I saw my favorite hot dog place in Manhattan. Grays Papaya. OMG! Now remember that I am about 90% paleo and I haven’t digested a slice of bread in over a year, so you can imagine how my system was going to react to a couple of white flour, processed, buns with grilled hot dogs and all the trimmings. They sure tasted good going down, however they left me in a lurch later that evening. 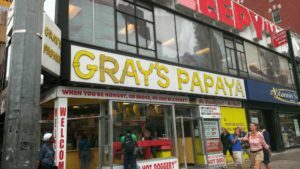 Grays Papaya is famous in the city for their hot dogs and papaya drink. I had both and they were sooo good. It was like a sin to eat something that tasted that good as processed as it was. I always talk about balance right? Well, I figured I hadn’t had one in so long, it wouldn’t hurt. WRONG!!!! I will spare you the details of what happened a couple of hours later. Inside the Host Hotel. I just had to take a pic. I called a good friend of mine, Michael who moved to the city almost four years ago. Michael and I used to to perform in plays and musicals together semi-professionally. Michael was keeping the dream alive in New York while I turned to health and fitness. To my surprise he was willing to go to the expo with me so I could check-in. 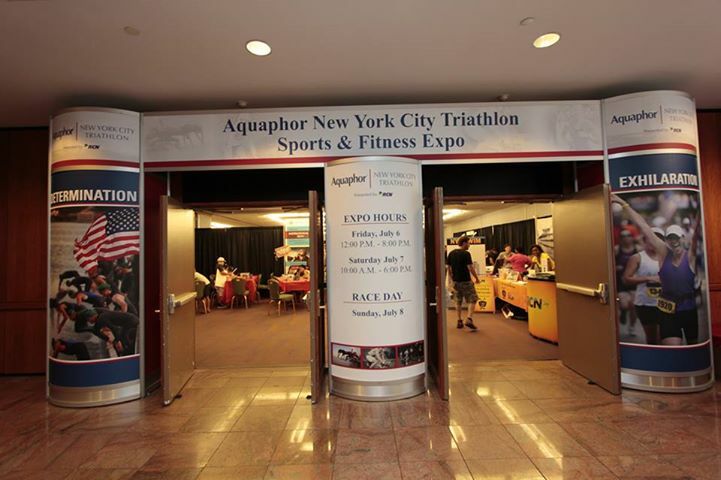 The New York Triathlon required the attendance of all the athletes at a mandatory meeting in order to verify everyone had the information in the Athlete Handbook. In order to get your packet you had to attend a meeting and get your hand stamped. Because I had been to so many races prior and never usually went to the meetings, that I would be a little annoyed but the person whom MC’ed the meeting was hilarious and had us all in stitches. He also was great about getting the info out specifically and succinctly, so all of us whom attended could have our hand stamped and out of there in about 25 minutes. The rest of check-in was a breeze. The expo was, well…interesting. Mainly because I was in a different part of the US, it had different vendors. What I did notice was that Zicco Coconut Water was a huge sponsor. They were giving out coconut water like it was, uh…water. Even in our SWAG there was one of those huge liter bottles that usually sell for around $9. I love Zicco so I was beyond freaking thrilled. The only unfortunate thing was that they only were giving the original version and I know that the chocolate flavor is amazing, but I enjoy the natural flavor too. The rest of the expo was what you would expect of a triathlon which is minimal compared to marathon’s and big road races, but it still had that great race aura and energy. 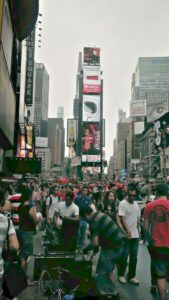 Michael and I hung out for a bit and caught up and then headed to Restaurant 44th&10th which is located, can you guess? You are correct. 44th st and 10 Ave just about 20 more blocks from the hotel. The place is a corner of a set of stores and is decked out in white with colors used as accents on the walls and cushions of the chairs. The food was amazing. I had the grilled tilapia with steamed spinach and a sweet potato, butternut squash mash. Deliciouso! For desert was a dark chocolate flour-less cake which tasted more like mouse, and an organic banana sundae. WOW! 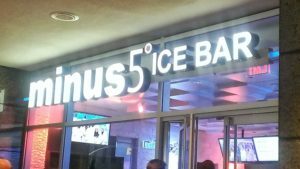 It was an outburst of flavors that stimulated my taste buds with the cool essence of banana, chocolate and toasted marshmallow. O-M-G was it good! Now all fat and happy, Michael and I headed off to my hotel, so I could drop off all the swag from the expo and that, ladies and gentlemen, is when Grays Papaya decided to fight for control of my digestive system away from my incredible food from 44th&10th. That is all I have to say about that. Needless to say after a couple of syndicated comedies, conversations about theatre in the city and dealing with my stomach I wasn’t going anywhere else that night. which didn’t open until 2 pm, and headed out into the city. Around 1 pm I stopped at my favorite pizza place. The restaurant will remain, forever, a planned event whenever I am in NYC. The place with the best pizza on the planet. John’s Pizza on 44th St between 7th an 8th avenues. This place has the absolute best pizza with all natural ingredients I have ever tasted. The thinnest flakiest crust with a spicy tomato sauce, mozzarella that strings to ceiling if you let it and the best ingredients ever resting on top. Personally, I am a minimalist so I prefer a nice pepperoni and fresh garlic, but my friend Jorge Acosta whom joined me for this amazing meal, was all about the pineapple and Canadian Bacon. I never tried it, but I have to say it was pretty good too. This part of 44th st is a kind of home to me. It is where all the best theatres are located. Across from John’s , Phantom was playing. Directly next door, Let it Be. 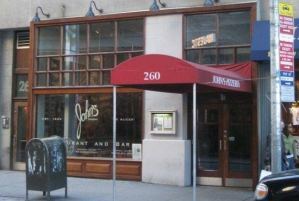 A little further down and across the street was Lucky Guy with Tom Hanks and two doors down was the famous Sardis of which Jorge and I headed to afterward to continue catching up. Jorge is one of those guys who has had such an amazing life that we can just talk forever. If I wasn’t participating in the triathlon the next day, we would probably still be talking. He is an amazing and talented guy and I am so excited he is making it in NYC as an actor. Knock on wood, he hasn’t needed another job to get him by. That is how talented this guy really is. at the Boston Marathon. Instead of bringing in a transition backpack like I usually do, now a plastic transparent bag is the only thing allowed to bring gear into the transition area. I didn’t want to leave anything besides my bike, so I personally didn’t bring anything at this point but my bike. I left my bike with a plastic bag covering the handlebars and seat and headed out to meet another friend of mine from high school, Kyle. Kyle, a professional Opera singer, is just as interesting. He had just opened a show, so we were able to meet just outside of Lincoln Center for a bit before he needed to be at the theatre. Kyle has an amazing wife, Laura and an eleven year-old prodigy daughter. A prodigy in what? It would probably be easier to tell you what she is NOT a prodigy in . She is incredibly smart as well as an Olympic swimmer in the making. Maybe I can get lessons from her? Kyle and I talked for an hour about his shows, my races, Alana’s talent and Laura’s singing as well. When it was time to head out Kyle said something to me that made me so proud. He started with, “I know you will probably taught this but Laura and started doing this ‘Insanity’ workout and I feel better, taller and stronger than I have ever been.” I praised him, because I use the Insanity workouts and I am a Beach Body coach. I was so excited to hear about his and Laura’s results. He went on to tell me about how everything was better. He was singing even better, he felt taller, slept better and was craving the workouts. It made me smile when I heard about it. Right here was proof, that with a child that needed to be brought to school, activities, swim practice, his daytime rehearsals, night-time performances, and Laura’s full-time job, they both still found time to workout six days a week. Remember that living in New York City means taking even more time for transportation as well. There are very few people that are as busy as Kyle and Laura and they still find time, six days a week. No excuses. I love it. That finished my day. I went back to the room, took a shower and fell into bed exhausted. I know it would feel like no time at all, before the 3 am alarm would go off and my phone would remind me again at 3:10. I would try, but I wouldn’t get as much sleep as I wanted. My room prior to the move. This looks like it’ll be a blast! Wow a lot of work goes into this huh! Good luck buddy! Great race report. 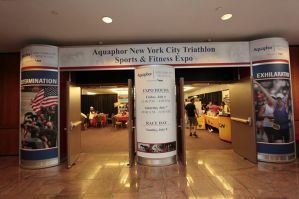 I tried to get to this race this year as a member of Team Aquaphor but had family stuff to take care of and travel to. Almost there – made it to Philly. You had a very hot race day.